Ugadi is one of the year’s most awaited Festivals. Ugadi or “New Year”, ushered in by spring, is the season for everything fresh and new and of course, a time to prosper and grow. It is that time of year when the earth is blessed with vibrant new lift and celebrated with great joy in South India, especially in Karnataka, Andhra Pradesh and Maharashtra. It is a time to rejoice with family and friends, enjoying great food and exchanging gifts. For the people of Karnataka, where I now live, Ugadi is the first day of the “Chaitra Maasa” as they get ready to welcome the New Year in their festive best. Mothers shower their daughters with gifts. Even though Ugadi is not officially our festival, we celebrate it with even more enthusiasm than the Tamil New Year because we’ve spent more of our lives in States that celebrate Ugadi. My grandmother firmly believed in giving more importance to local festivals and we got into the rituals of spring cleaning and preparing for it just as enthusiastically as our neighbors. I have happy memories of “puran poli” a sweet lentil and jaggery dish loved by the whole family along with an elaborate meal. Special focus is on delicacies made with raw mango and neem flowers. We also collect the neem flowers, dry them out and store them in the freezer for use throughout the year for tummy aches and other home remedies. This year, just like the past six years, I will be missing my Mom very much as I go about cleaning my kitchen, something we both enjoyed doing together, amidst much laughter, joking and teasing. This year, I will also miss my son who is away at college. But my memories will keep me company and in good spirits as I await his next visit. Obviously, a clean home is the crux of any celebration. A fresh start. It is also a great activity to get children involved as we teach them about the festival and the importance of a clean home. With the temperatures soaring way beyond expectations, it is an advantage as well as a disadvantage. The problem is, it is the season when unwanted pests and critters seek shelter in the coolness of our homes. The advantage is – cleaning is a breeze, what with the sun being generous enough to shine down on us and quickly drying everything we wash.
We certainly want to #SayNoToFoodPoisoning while we go about our festival preparations. Cleaning out the cobwebs and dust. Oh yes, so much construction going on around our place that the heat and dust is unbelievable. My first stop is to vacuum the home, since sweeping it will only rearrange the dust! This will be a daylong process. And pretty tiring, yes. Stripping all the beds, curtains, cushions, sofa covers and run the washing machine overtime. Yes, we want our house smelling good with fresh linen and furnishings. The good news is, the sun is ever ready and waiting to dry our clothes. Fresh sheets feel so nice! Spray Godrej LAL HIT in all the strategic points (sink outlet, under the gas cylinder, under the fridge to name a few) to keep those pesky cockroaches away. The deep reach nozzle of the Godrej LAL HIT makes it easier for us to spray in these places. Today, my house is more or less spotless and I can sleep easy, knowing that I don’t have to worry about pests. Later in the evening, I will go shopping for flowers and other festival stuff. I’ll adorn our altar with fragrant flowers before I go to bed. I’ll decorate our threshold with “rangoli” – so that it dries through the night without foot traffic to disturb it and tie bunches of mango leaves and flowers at the doorway. And when I go to bed tonight, I will place the traditional mirror, a silver coin and a gold chain by my bedside to look at first thing in the morning for luck. My husband and I will wish my son were with us. I will miss his enthusiastic presence in the kitchen as we joyfully prepare his favorite dishes. I will miss my Mom, but feel her blessings. I will be busy planning the menu in my head as I drift off to sleep. Do you celebrate Ugadi? What’s your plan of action? Besides the usual preparation for the celebration what I loved most is the idea of sleeping with a mirror, a silver coin and a gold chain by bedside to look at first thing in the morning for luck. Happy Ugadi, Vidya. Thank you so much for sharing this beautiful festival with us. I’m in the middle of spring cleaning too. I love this time of year, and especially love the brightness of the days and the colorful flowers that make it so. Happy Ugadi – a lovely way to make the change. We need more of that here. I actually enjoy housework, Yolanda. I find it quite therapeutic. Spring – the word has such a fresh ring to it. Hugs back! Happy Ugadi Vidya. Ahh, spring-cleaning time…I seem to be doing it perennially though! Some or the other thing perpetually needs cleaning and fixing at my place. Loved your post as you took us through the motions you’ll be following through in preparation. Hope your son joins you soon for vacations. Btw those images were super-wow…yours? Hehe. 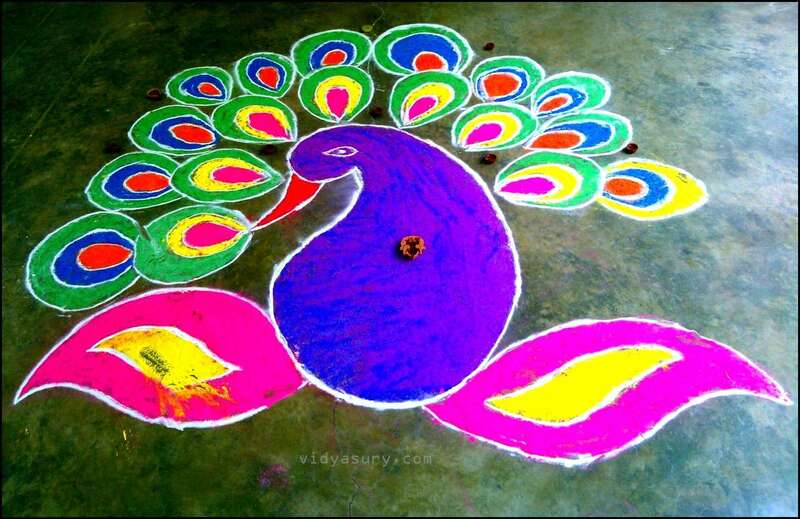 The rangoli is mine. And yes to the perennial cleaning – it is a never-ending thing at my place too! Son will be home in May. Happy Ugadi! What a lovely sounding festival. Thank you Darla. Oh you should see our local market – it looks so beautiful with flowers, fruits and all kinds of clothes and stuff! Thanks for sharing. Happy Ugadi. What a lovely tradition! Isn’t it interesting that spring gives us the urge to start fresh? It is! 🙂 And it is so much fun to see everyone collectively at it, Lee! Thank you for coming by! It did, thank you, Birgit. My area was a riot of colors. I love these traditions too – they bring people together in happiness!